The University of Central Asia’s Institute of Public Policy and Administration (IPPA) and the International Food Policy Research Institute (IFPRI) co-hosted a conference on Agricultural Transformation and Food Security in Central Asia, 8-9 April, 2014 in Bishkek, Kyrgyz Republic, engaging government officials, development partners and researchers from the region and abroad in dialogue on food security research. The conference unveiled IFPRI's Central Asia Research and Capacity Strengthening Program which will contribute to ensuring food and nutrition security, improving livelihoods, and conserving natural resources through sustainable agricultural development in Central Asia. “We are beginning a joint research program that will extend for several years. We should consider these two days an opening chapter in a longer set of joint research topics, studies and analysis that we can undertake together,” said Dr. Karen Brooks, Director of the CGIAR Research Program on Policies, Institutions, and Markets. The Central Asia Research and Capacity Strengthening Program will be implemented in partnership with the Eurasian Centre for Food Security at Moscow State University, UCA and other research institutions in the region, as well as with the CGIAR Research Programs on Policies, Institutions, and Markets and on Agriculture for Nutrition and Health, both led by IFPRI. “The University of Central Asia is delighted to be an actor within this larger research framework in partnership with IFPRI. 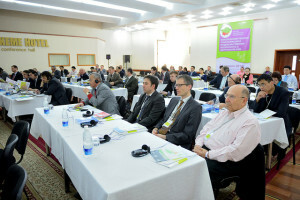 This conference is an important step in engaging the Central Asia research community in the critical issue of food security in the region,” said Dr. Horst Weyerhaeuser, Director of UCA’s Mountain Societies Research Institute, who moderated a session on Agricultural Trade and Regional Integration. During the conference, IPPA's Head of Research, Dr. Roman Mogilevskii moderated a panel on Agriculture, Structural Transformation and Food Security in Central Asia and presented a paper on Agricultural Trade in Central Asia. IPPA Research Fellow, Dr. Kanat Tilekeyev moderated a session on Food Safety and Nutrition, Value Chains, and Linking Farmers to Markets and presented a paper on Access to Improved Seed and Fertilizer and Agricultural Performance in Kyrgyzstan. The conference sessions began with a keynote address on Agricultural Transformation and Food Security in Central Asia: Institutions, Markets, Value Chains, and the Role of Government Policy by Dr. Johan Swinnen, Professor of Economics and Director of the LICOS Centre for Institutions and Economic Performance at University of Leuven in Belgium. This was followed by sessions on agriculture, structural transformation, food security and food safety and nutrition in Central Asia, value chains, agricultural trade and regional integration. A roundtable on policy issues and research priorities in Central Asia concluded the first day of the conference. The second day kicked off with a keynote address on Agricultural Transformation in Central Asia: Land Reform and Consolidation, Farm Reorganization, Access to Modern Inputs and Agricultural Productivity by Dr. Zvi Lerman, Sir Henry d’Avigdor Goldsmid Professor of Agricultural Economics from The Hebrew University, Israel. Consequent sessions focused on land reform and consolidation, farm reorganization, agricultural productivity, migration, remittances, export participation, household welfare in Central Asia, agricultural policies, constraints and modern input use in Central Asia, and climate change and its impact on agriculture and food security in Central Asia. Policy issues, research priorities and strengthening capacity in Central Asia were discussed during a final roundtable discussion. Conference discussions helped to identify knowledge gaps in agricultural and structural transformation and food security policy in Central Asia. “This will inform future research and capacity strengthening activities for IFPRI and its collaboration with UCA and other partners in the region,” said Dr. Kamiljon Akramov, the Program leader and research fellow at IFPRI. This initiative is funded with support from the Ministry of Finance of the Russian Federation, the CGIAR Research Program on Policies, Institutions, and Markets, the CGIAR Research Program on Agriculture for Nutrition and Health, and the United States Agency for International Development (USAID).